Fortunately for the Columbus Blue Jackets, a team called KalPa in the Finnish hockey league completed its season last month well below the line to make the playoffs. Alexandre Texier, a 19-year-old centre, scored in overtime to win KalPa’s finale on March 14 . Then he packed up and headed to North America, making his continental debut with the Blue Jackets’ top farm team two days after he stepped off the ice in Finland. The stay in the minors would be brief. Last Friday, Texier, who is from Grenoble, France, made his NHL debut in a playoff-clinching win by Columbus at Madison Square Garden in New York with his parents in attendance. A day later in Ottawa, he scored his first goal , collecting a pass from Oliver Bjorkstrand in full stride and ripping it in like an NHL veteran. Texier has impressed everyone who matters. He insisted he is not nervous even the slightest bit, even though the spotlight will get much hotter when Columbus opens the playoffs on Wednesday night at Tampa against the league’s best team. It’s been a whirlwind for the kid who was a Blue Jackets’ second-round draft pick (45th overall) two years ago . Texier did not come out of nowhere. Columbus general manager Jarmo Kekalainen has been watching him and talking about him since Texier came under the team’s umbrella two years ago. He was one of three prospects the GM deemed untouchable at the trade deadline. The Blue Jackets couldn’t get him here fast enough. After leading KalPa in assists, points and shots, he tore it up in Cleveland with the Monsters, collecting five goals and two assists in seven games. Then came his high-pressure NHL debut Friday in which he handled himself admirably. Blue Jackets centre Pierre Luc-Dubois knows something about being a hockey prodigy. He debuted in the NHL at 19 last season and turned into one of the team’s stars. He’s also from Quebec, so he can speak French and communicate with “Tex” better than his other teammates. And talk about a small world: They discovered their fathers played together for a season in Canadian junior hockey years ago. Texier, who seems to have adapted seamlessly to the different rink dimensions in North America, likely will play with Bjorkstrand and Nick Foligno on the fourth line, although Tortorella is known for mixing things up. “It was a bonus for me (to join the Blue Jackets) because they are a pretty good team and they want to make the playoffs, so I didn’t expect anything,” Texier said. Tortorella said he’s not hesitant about throwing Texier into the playoffs, regardless of his tender age and lack of experience. “This kid here, I just think he had an attitude that he’s not afraid of anything,” Tortorella said. 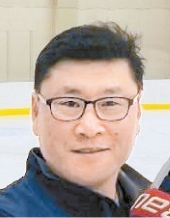 Ask Korea head coach Jim Paek about the upcoming men’s hockey world championship, and he’ll readily admit his team will face an uphill battle. Yet Paek insisted on Monday that doesn’t mean he or his players should be afraid of the challenge ahead. Paek, former Stanley Cup-winning defenseman for the Pittsburgh Penguins in the National Hockey League (NHL), will lead Korea to the International Ice Hockey Federation (IIHF) World Championship Division I Group A, starting on April 29 in Astana, Kazakhstan. It’s the second-highest level of IIHF world championships, and the top two nations after the round robin play will be promoted to the elite division for 2020. Korea was relegated from the top competition last year, losing all seven matches by a combined 48-4. At No. 16, Korea is the third-highest ranked team in the field of six nations. It will go up against Belarus (No. 14), Slovenia (No. 15), Kazakhstan (No. 18), Hungary (No. 20) and Lithuania (No. 25). To get past these opponents, Paek said his team will look to rely on its past experience. In 2017, Korea finished in second place in the Division I Group A tournament to earn its first-ever promotion to the elite division. And the following year, Korea made its Olympic debut, playing in the PyeongChang Winter Games as the host country and going up against NHL stars from the likes of Canada, the United States and Finland at the world championship. Opponents at this year’s worlds may not be in the same league as those countries from the elite division. But Paek said he won’t make any drastic changes to his team’s approach. Korea is a team in transition. Some Canadian- or U.S.-born players were fast-tracked to Korean citizenship before PyeongChang, but most of them are not with the team for this year’s worlds. Only goalie Matt Dalton and defensemen Eric Regan and Alex Plante are still in the mix. Missing forwards Michael Swift and Mike Testwuide will likely leave big holes on the offense, but Paek quipped that lack of scoring has always been a problem. The last-placed team from Division I Group A will be further relegated to Division I Group B next year. Paek opened camp here last Monday. The players will go through on- and off-ice training here through today, and travel to Tomakomai, Japan, tomorrow for two exhibition matches against the Japanese national team on the weekend. Korea will then return home for more training at Jincheon. The team will depart for Kazakhstan on April 23, six days before the start of the tournament. Paek’s coaching staff received a reinforcement in the form of a former NHL forward Sergei Nemchinov, who will work with Korean players for the world championship. Like Paek, Nemchinov is a two-time Stanley Cup champion, and he also represented Russia at the 1996 World Cup and 1998 Nagano Winter Olympics. He won two world championships with the old Soviet Union in 1989 and 1990. For coach Hu Jiang and China’s ice hockey players, the clock is ticking to the 2022 Beijing Winter Olympics. He has often felt the weight of a nation in his selection and training of players for the event. “Ice hockey is quickly growing in China, especially in terms of the number of players and the scale of tournaments. But it still takes time to close the gap with the superpowers in the game,” said Hu, who is also a deputy representing the Heilongjiang province at the National People’s Congress. The International Ice Hockey Federation has granted China spots in the men’s and women’s section for 2022. China was ranked 33rd in the 2018 men’s world rankings. The 43-year-old built his coaching reputation with Qiqihar, Heilongjiang province, where he grew up and received training as an ice hockey player. He started playing the game when he was 10, and turned professional in 1992. “The training of professional teams has always been rigid, with the inevitable injuries and fatigue. But I never allowed any complacency,” he recalled. He was first selected by the national team in 1997, and remained part of the national squad before retiring in 2008. Hu attributed his success as a player to hard work during training and his natural fitness. After his retirement, Hu became an assistant coach with Qiqihar’s men’s hockey team. He was appointed head coach in 2013. He went on to guide the team to several national championships and trophies between 2013 and 2018. His love for the game also empowered him to guide his son, Hu Wenhan, 14, to become an ice hockey player. “To me, ice hockey is the best way to improve physical fitness and the team spirit of a child,” he said. However, Hu can barely spare time to coach his son, who has been training under his own coaches. The youth ice hockey friendly between China and Russia in June last year, a match that was watched by President Xi Jinping and Russian President Vladimir Putin, was the first time that Hu Wenhan played under his father as coach. However, Hu insisted that the father-son relationship was not a factor that affected his team selection or tactical decisions on the ice rink during the game. “On the rink, I was the coach and he was only one of the players,” he said. As a coach to the men’s national team, Hu has long been troubled by the shortage of homegrown talent. During the Asian Winter Games in Sapporo, Japan in 2017, he expressed his worries about the lack of top players available for selection after Team China was outscored 32-0 in its three games. In order to truly catch up with the ice hockey giants in the world, the country should continue to focus on the fundamentals, he said. He noted that the deficiency of top players was not simply because of a lack of young players coming through. Indeed, young players registering for the game surged to about 20,000 last year compared with a mere 300 players about 10 years ago, he said. In Harbin and Beijing, 200 primary schools have launched ice hockey teams, in which at least 6,000 pupils have participated. “One problem is that children are giving up the sport as soon as they enter junior high schools as they begin to come under greater academic pressure. Meanwhile, there are barely any middle schools that are running ice hockey teams,” he said. The lack of channels for young hockey players to progress through the academic system is another important reason, as few colleges in China grant scholarships to children playing the sport, he said. He noted that a number of players for the Chinese men’s hockey team, such as Ying Rudi, Song Andong and Yan Juncheng, moved to North America for ice hockey training when they were about 10 years old. Song Andong was the first Chinese-born player drafted into the National Hockey League. He was drafted in the sixth round, 172nd overall in the 2015 NHL Entry Draft by the New York Islanders. “Going abroad was virtually their only choice if they were to continue to seek a career in ice hockey,” Hu said. Currently, only two colleges in China, Harbin Sport University and Beijing Sport University, run ice hockey teams, even though the Ministry of Education greenlighted at least seven other universities to host ice hockey teams. He called on education authorities to come up with concrete policies and a plan to support the development of ice hockey so that young players can have a way to get through college with ice hockey scholarships. “The development of college games is the core part for the sustainable development of ice hockey. By having college hockey teams, we can also encourage the growth of teams at primary and middle school levels,” he said. When Kuwait’s women’s hockey team makes its IIHF debut this April at the 2019 Challenge Cup of Asia (CCOA), it will be with a roster full of family connections. Included on the team are several sets of sisters, as well as a set of triplets. In fact, familial connections seems to be a significant factor behind how Kuwait’s women’s program has grown since it was resurrected in 2017. “Most players are family, sisters, cousins,” said head coach Meshal Alajmi, who has represented Kuwait on its men’s hockey team for over eight years. Sharing the CCOA experience with family will no doubt be exciting for the women representing Kuwait in Division I of the tournament later this season, especially considering the fairly recent relaunch of the country’s women’s hockey program. A program for female players was initially created in 2007, but consisted of only around 10 people and, lacking support, quickly ended. However, those players reunited in a second attempt to build a program in August of 2017. Part of this relaunch involved sending Albahouh and women’s national team supervisor Laila Alkhbaz to the 2018 IIHF Women’s High Performance Camp. Albahouh learned about growing the sport in the World Girls’ Ice Hockey Weekend segment, while Alkhbaz took part in the Leadership Development Program. This professional development and the efforts of the players in the program seems to be paying off. The IIHF website lists Kuwait as having 203 female players—53 more than the 150 listed male players (also listed are 177 junior players). However, similarly to other CCOA participants, Kuwait has struggled to find younger female goaltenders. The national team’s two goalies are two of the older members of the team at the ages of 26 and 32. The country also has just one rink that they use for hockey, which is closed this January and February, meaning that the team is practicing off ice in preparation for the CCOA. “In our country, it’s not a desert, but it’s hot. So we try to escape to cold places … [the rink] is an escape place,” Albahouh explained of the hockey venue, which the women’s program usually uses at least twice a week. Albahouh is aware of the challenges she faces with trying to grow and play hockey in her country, but regardless is looking forward to representing Kuwait with her hockey family at the 2019 CCOA in Abu Dhabi. Albahouh, who took up hockey after seeing another Kuwaiti girl playing it, is eager to share the game she loves with other girls and women, and hopes that participating in the CCOA will help open more doors. 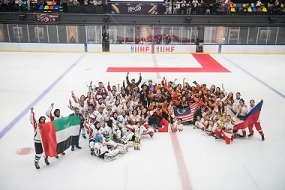 In just under five months, Abu Dhabi’s Zayed Sports City Ice Rink will play host to the 2019 IIHF Women’s Challenge Cup of Asia (CCOA), the first IIHF women’s competition to be hosted in the United Arab Emirates (UAE). While Abu Dhabi has hosted the Men’s CCOA three times before, this will be a a momentous event for the country’s women’s program. For Al Qubaisi, this will be an especially important event; she waited over a decade and a half before there was an opportunity for her to play hockey. As Al Qubaisi explained, the past few years have seen an increase in women’s hockey programs in the Middle East. Kuwait will be making their IIHF women’s debut at the 2019 CCOA and two non-IIHF members, Saudi Arabia and Bahrain, have recently started women’s programs. While the UAE became a IIHF member in 2001, the country did not have a women’s program until 2010. They made their first IIHF competition appearance in the 2014 Women’s CCOA Division I tournament, finishing in last place. The team did not play in the CCOA for a few years following their debut, but returned to the competition in 2017. They improved on their inaugural performance, finishing second to last and notching their first ever IIHF win, a 6-4 victory over India. In the 2018 Women’s CCOA Division I tournament, they rose to second place, beating India and the Philippines and losing to eventual champion Malaysia. The UAE team will be competing in the Division I tournament again in 2019, and look to continue to improve upon their previous results. Al Qubaisi and Al Mazrouei, along with other players such as Fatima Al Ali, have been with the national team program since its first CCOA appearance in 2014 or even earlier. Before joining the program, most of them knew about hockey from films such as Mighty Ducks or from their parents’ previous experiences with the sport. The country’s 78 registered female hockey players, as well as the majority of the national team, mostly play on teams in the UAE’s capital city of Abu Dhabi. However, with the recent formation of a new team in Al Ain, Al Qubaisi anticipates that they will see more players coming from other parts of the country to join the national team. The national team has received a lot of attention over the last few years with the rising popularity of forward Al Ali and the team’s trip to North America for the NHL’s Hockey is For Everyone month this past February. However, for Al Qubaisi, who has dropped a ceremonial puck in front of 18,000 fans at a Washington Capitals game and travelled around the world to play a sport she loves, the experience that she names as her favourite hockey experience is a reminder of the joy these players have just being able to play a sport they love. Al Qubaisi may or may not realize it, but her and her teammates are the pioneers of women’s hockey in their country, and the 2019 CCOA will no doubt play an important role in the growth of the sport in the Middle East. 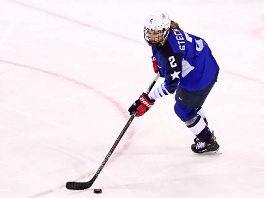 At the 2018 IIHF Women’s Challenge Cup of Asia (CCOA) Division I tournament in Malaysia, there was one player who lit up the scoreboard at a rate of 2.67 goals per game. Bianca Cuevas scored eight goals (and notched one assist) in three games for the Philippines’ national women’s hockey team. Her eight goals were more than any other female player in both of 2018’s CCOA and CCOA Division I tournaments. 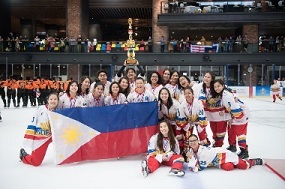 The Philippines’ national women’s team made its IIHF debut at the 2017 CCOA, where Cuevas also demonstrated her scoring prowess, leading her team in points with five goals and four assists through six games. The journey that Cuevas took to representing her country on the international stage and becoming a leading goal scorer took her from the Philippines to Canada. Cuevas first started her career on ice as a figure skater. As a young child, her and her older brother were enticed by a skating rink that they saw in a mall in Manila, leading her mother to sign her brother up for hockey and Cuevas up for figure skating. “Later on, watching my brother, it made me curious and interested in what he was doing, so I wanted to try hockey,” said Cuevas. Cuevas’ first few years of hockey were spent honing her skills in the co-ed Manila Ice Hockey League (MIHL) and with a youth team that competed in the annual Mega Ice Hockey 5’s tournament in Hong Kong. However, it was in Canada where Cuevas would become the player that she is now. In 2016, a new rink was opened in the Philippines’ Cebu City, and an NGO called Pandoo Foundation held a hockey camp to celebrate its opening. The three day camp was run by NCAA Division I Niagara University alumni Sarah Zacharias, Sam Goodwin and Robert Martini. “[Zacharias] approached me [at the end of the camp] and she invited me to train with her team in Winnipeg,” said Cuevas. Zacharias helps coach the Balmoral Hall Blazers of the Junior Women’s Hockey League (JWHL). The Balmoral Hall roster was full by the time Cuevas arrived in Winnipeg, but Zacharias found her a team that she could play games with in the Manitoba Women’s Junior Hockey League (MWJHL), the Western Predators. Cuevas noticed this improvement when playing in the 2017 CCOA. She felt faster and stronger, and was able to score a significant number of goals. Her teammates and coaches from the national team told her that they also noticed a difference in the way she played. After the 2017 CCOA, Cuevas returned to Canada, where she was accepted into the University of British Columbia in Vancouver. Cuevas wanted to be able to keep playing hockey, and so tried out for the Richmond Rebels of the South Coast Women’s Hockey League (SCWHL), a Senior AA league with teams in BC’s Lower Mainland as well as on Vancouver Island and in Kamloops and Prince George. While Cuevas didn’t make the cut for the Richmond team, she was referred to the North Shore Rebels, who made their SCWHL debut in the 2017-18 season. The Rebels missed out of the playoffs in their first season, but are looking stronger after their first five games of the 2018-19 season, and already just one win away from matching their total number of wins from last season. Besides playing in the SCWHL, Cuevas hopes to be able to continue to play for the Philippines’ national women’s team, which will compete in the 2019 Women’s CCOA Division I tournament in Abu Dhabi, United Arab Emirates in April. While in the past, any Filipino woman who played hockey could make the national team, Cuevas is anticipating that the coaching staff will need to make cuts for the 2019 CCOA. The Philippines currently has 33 registered female hockey players, a significant increase from when Cuevas first started playing in 2009. When she first started, representing her country on the international stage was far from her mind. “If you asked my 10 year old self or 12 year old self, I probably would say that that would never happen, because we didn’t even have enough girls for a line.